It's Dr. Seuss - BABY! Another Little P to add to your tride and true baby quilt patterns! It was so easy to create this Dots 'n Tots Quilt Pattern using the fun, pastel dots and stripes in the Celebrate Seuss 2 collection! True to Seuss' illustrations, I took a traditional quilt block, the bowtie, and stretched them out for some wonkiness factor. Solid sashing added a nice strong frame to the blocks. The design is perfect for that little one in your life. We made it simple and easy to showcase the fabrics. I love that this only uses four fat quarters and a solid accent - less to think about when rifling through your favorite prints. We used our Moda’s Snuggle fabric for the backing of our quilt, for a very soft and cuddly finish. 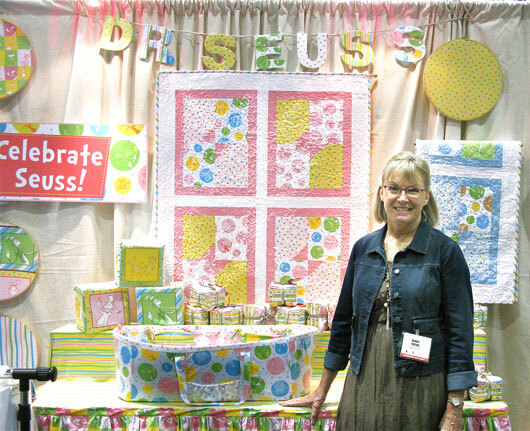 The Robert Kaufman display at Spring Market showcases lots of ideas on using this fabric for decorating a nursery. While our sample uses the frothy, airy colors of Celebrate Seuss 2, we would love to see it made in brighter versions. If you have one, please send us a picture! Quilt shop owners, you can find this at United Notions, Checkers, Brewer and EE Schenck as ISE-504!